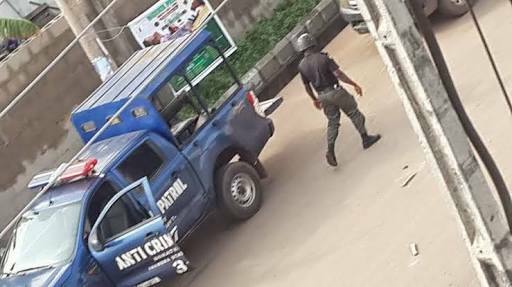 The police in Delta State has busted a human trafficking training home, located in Umuagu Quarters in Asaba, the state capital. Though the sponsor of the human trafficking training home one Madam Ejiro was nowhere to be found when the police team stormed the place, it was gathered that the group rescued six women alleged to have been prepared for a journey to Ghana. The Police Commissioner in the State who disclosed that the women would help for further investigation, however, assured Deltans of Police willingness to eradicate all forms of crimes in the state. At the training base was recently opened by the said Ejiro who hails from Oghara Community, and had been in Ghana over the years until recently she moved into Asaba to assemble desperate ladies willing to travel out for greener pasture, women are allegedly taught the rudiments of making money through selling their body for s*x in Ghana. Speaking to newsmen, one of the arrested victims of human trafficking, Christiana Odigie from Benin City, Edo State said: “The monarch in Benin had placed a curse on trafficking, and I have no job doing, so somebody introduced me to Madam Ajiro in Asaba, she had not taken any money from me, she promised to take me to Ghana before the police arrested us”. President Buhari Endorses 30,000 as New Minimum Wage!